This Tuesday is the first of the two 2014 World Cup semifinals with Brazil facing off against Germany in a repeat of the 2002 World Cup final. During that match in Japan, Brazil won out thanks to two second half goals from Ronaldo. This time around Germany will be hoping this more talented team can turn the tables. The big news coming into this match is, of course, the injury to Neymar and how Brazil can cope without their star. In addition to the loss of Neymar is the loss of captain and defensive stalwart, Thiago Silva. His needless yellow card that leaves him ineligible is indicative of this current Brazil squad. This is a team that does not thrive on the typical Brazilian flair, but instead on an aggressive agenda that has them averaging 19 fouls per game (when they are called). They managed to bully their way past Colombia thanks in large part to an inept referee who refused to take control of the game and let Brazil run rampant. They also average 2 yellow cards per game and have amassed a total of 10 from their five matches played. These are about the only statistics which favor Brazil compared to Germany. Germany tend to dominate possession as well as passing statistics. They average 87% pass completion compared to Brazil’s 81%. They also have a 58% shot accuracy rating compared to Brazil at 53%. Both teams have scored 10 goals each while Germany has allowed just 3 goals and Brazil has allowed 4. Both teams have identical records in this World Cup having won four matches and drawn one. 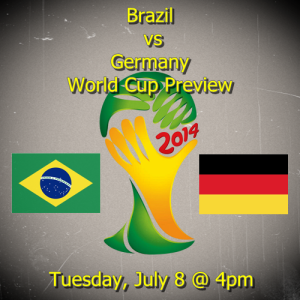 Germany will likely continue to play their methodical possession based game and look for the breakthrough while attempting to exploit the sometimes weak Brazilian backline. Unfortunately, this is shaping up to be a match in which the referee could play a major role. So far, the referees have been very lenient with this Brazil team and I really hope this ref can be stronger and not be afraid to give a card or two and stop the incessant fouling. My prediction is that this will be a very close match, but one in which Germany will ultimately triumph. Brazil will be without their leading goal scoring and have two misfiring strikers who have just one goal between them. For Germany they have been able to spread the goals among their attacking midfielders as well as 5 goals between their forwards, Mueller and Klose. The weather doesn’t look like it will play much of a role on Tuesday with the forecast putting temperatures in the low to mid 70’s and mild humidity around 65%. This certainly will favor Germany who will not have to worry about high temperatures and extreme humidity providing an advantage for Brazil.